It's A Dan's World: AQUAMAN TO RETURN IN BRIGHTEST DAY? 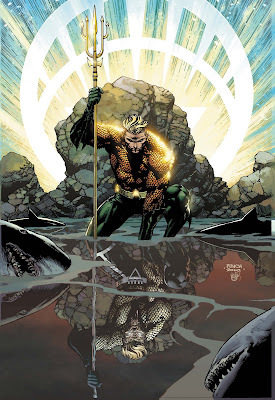 AQUAMAN TO RETURN IN BRIGHTEST DAY? How can one image empty your wallet? Easy - when it's this Aquaman centric David Finch cover, for the second issue of the upcoming bi-weekly series Brightest Day. Guess I won't be waiting for the trades after all... Take a moment to soak in the awesome, then check out what writer Geoff Johns has to say over at DC's Source blog. Agreed. This image sold me on buying this title.